ABOVE: A car descends from the upper station of the Funiculaire de Montmartre. The Basilica of Sacré-Coeur is in the background. 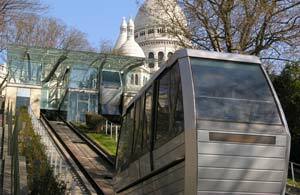 INSET BELOW: Use a Métro ticket or your Paris Visite pass to ride the funicular. For mobility-impaired or out-of-shape tourists visiting the Basilica of Sacré-Coeur, the Place du Tertre, and other attractions atop the Butte of Montmartre, the steep uphill climb from the Place St-Pierre can be difficult or impossible. Fortunately, there are other choices--among them, the Funiculaire de Montmartre, which serves an elevator between the foot of the hill and the rue du Cardinal DuBois, where a final (and relatively short) flight of steps leads up to the basilica. The Montmartre Funicular opened for business in 1900. It originally relied on hydraulic power for the ascent and gravity for the trip downhill; the hydraulic system was replaced by an electric motor in 1930, and the funicular was completely rebuilt in 1991. The current funicular has two 60-passenger cars, which run on parallel tracks that ascend 36 meters or 118 feet between the lower and upper stations. Each car operates independently, like an elevator (and unlike the many funiculars where each car is a counterweight to the other). The Montmartre Funicular is operated by RATP, the Parisian regional transport authority that runs the Métro subway network and the RER commuter-rail lines. You can use a standard Métro ticket to ride the funicular; Paris Visite, Mobilis, and other RATP passes are also valid for transportation. (See our Paris Métro tickets and passes page for more information.) If you don't have a ticket or pass with you, you can buy one in the upper or lower station. Hours of operation are 6 a.m. to 12:45 a.m., seven days a week. Otherwise, you can take the RATP's Montmartrobus, a compact bus that runs between the Place Pigalle and the Mairie of the 18th arrondissement via the Butte Montmartre every 12 minutes from early morning until mid-evening. Another option is Le Montmartrain, a rubber-tired tourist train that departs the Place Pigalle every 45 minutes for the Butte Montmartre and Sacré-Coeur. Inset photo copyright © Paris Tourist Office.